Cache Cleaner, by Maxmilion Dunbar, Masks, My Barbarian, BFFA3AE, Michael Magnan, Jon Santos, BYCO & RVNG Intl. October 30, 2013 7:00–9:30 p.m. Remarks by Margaret Lee, Alanna Heiss, and Brian O’Doherty. Tickets begin at $120 and include a seated dinner, cocktails, and a performance. We’re pleased to announce artist and writer Brian O’Doherty as honoree for Triple Canopy’s fall benefit, which will take place Wednesday, October 30. 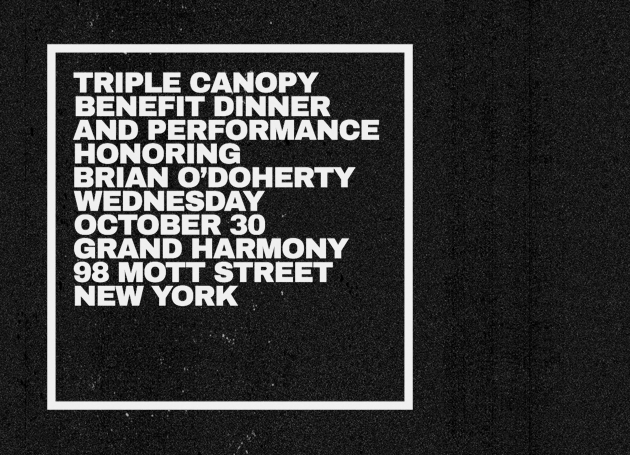 Please join the editors of Triple Canopy, our Board of Directors, and Publishers Circle members for a seated dinner, cocktails, and a performance in honor of O’Doherty’s extraordinary life and work. O’Doherty will be introduced by MoMA PS1, Clocktower Gallery, and ArtOnAir founder Alanna Heiss, and artist-gallerist Margaret Lee will make brief remarks; a performance by artist and composer C. Spencer Yeh will follow. Artist Virginia Overton has created a limited-edition artwork for the occasion. Unable to attend? Consider a tax-deductible contribution. For more information, write to peter@canopycanopycanopy.com or call (347) 529-5182. Virginia Overton is an artist based in Brooklyn. She is known for installations that place scavenged materials and those common to the manual trades into site-responsive configurations. She has presented solo exhibitions of her work at Kunsthalle Bern (2013); Mitchell-Innes & Nash (2013); The Kitchen, New York (2012); The Power Station, Dallas (2012); Freymond-Guth, Zurich (2011); and Dispatch, New York (2010). Her work is currently on view at the Westfälischer Kunsteverein, Munster, Germany. C. Spencer Yeh is a musician and artist born in Taipei, Taiwan, and now living in Brooklyn. Yeh has performed and presented work in a variety of venues and exhibition spaces, including the New Museum, New York; the Contemporary Art Center, Cincinnati; Issue Project Room, Brooklyn; White Flag Projects, St. Louis; Sónar; Frieze Music; and All Tomorrow's Parties. He has collaborated on musical and artistic projects with Nate Wooley, Okkyung Lee, Justin Lieberman, Tony Conrad, and New Humans with Vito Acconci.